The Sangoma FreePBX is the most powerful and flexible IP-PBX on the market. FreePBX is an all-in-one IP PBX that is completely Free to download and install onto your own hardware and includes all the basic elements you need to build a phone system. 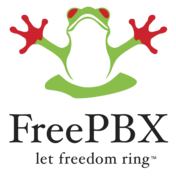 It is supported by Sangoma developers and by a global community of enthusiasts which help make FreePBX the most popular open-sourced IP-PBX on the market to date. It is controlled by a fully-featured web GUI which makes it very easy to use and deploy. Check out all of the details on the Sangoma FreePBX Datasheet.